What is smart design? And how do you best convey conceptual ideas into a compelling design? 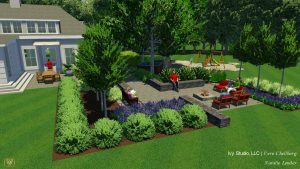 These are the questions that the landscape design professionals at IVY STUDIO, LLC based in Massachusetts grapple with on a daily basis. A good outdoor design needs to exude more than just sheer beauty. If it does not adequately serve the client and his/her unique lifestyle, and is not functional, it fails. Truly creative designs with pools and spas as the focal point must embody form with function, beauty with usability. An effective and brilliant design must reflect the client’s vision, their imaginings and should be as unique as their distinctive fingerprint. It should also add value to their home and increase their use and enjoyment of the newly expanded outdoor space where a pool and spa are the focal point. It must burst with creativity, combine sensitive with sensible and be grounded in functionality. It should also adhere to the client’s budget considerations. Many clients have difficulty conceptualizing design plans. How can we best convey ideas, no matter how brilliant and creative into life like visual aids? Besides developing 2-D plans our design professionals also create 3 –D color renderings that accurately depict the mood and feel of the spaces created. They can display the spaces from different perspectives, angles, height and depth elevations and let the client get a good feel for the spaces awaiting implementation. A test drive if you would of their expanded outdoor design! Contact IVY Studio at 781-591-0300 or vern@ivystudioMA.com to schedule your next outdoor expansion project test drive.